Our most popular Data-Only plan for Smartphones, Tablets and Hot Spots! After you purchase the first month which includes 1.0 GB of data (for $15), monthly Auto-Renewal is only $5 which keeps your data from expiring! Our month equal 30 days. With Auto-Refill, get additional High Speed Data for only $10 for each 1.0 GB. Although the plan doesn't support traditional wireless voice and text services, it does support services like Google™ Voice for voice and text messages. To ensure the SIM card is compatible with your phone, please go to the SIMS link located at the top of the page and reference the description for each. You can also visit our Help & FAQs page for further information. With a SIM Card, you can use your own compatible GSM or unlocked GSM phone for business nationwide with Clearway. Simply purchase a SIM card and enroll in the plan you’ve selected. By selecting "Enroll Now" your 1.0 GB of High Speed data service will be renewed automatically every time your current plan reaches zero data balance and $10.00 will be charged. Monthly Auto-Renewal ($5) keeps your data from expiring. 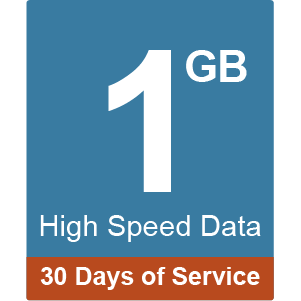 Auto-Refill ($10) and get 1.0 GB of High Speed Data once the Data you previously purchased has been consumed.